omg! you are a floral bombshell! love the new cut! adorable! love the outfit and i can't get over your new hairs style- it is AMAZING! ahhh LOVE this look! You look straight of a magazine. Amazing. omg! I love ittttt!!!!! that pant suit is all sorts of amazing! gorgeous! surprisingly, i LOVE that suit! Love your new cut!! And this coloured outfit!! You went a step forward and have ordered the matching pants too and you look wonderful! Your hair is so stunning, gorgeous! Still dying over the new do'! Such a great cut/style! I absolutely love this look. Takes a daring fashionista to pull this off, and you definitely did! Loved!! You look great with you new hair style!! There's been so much of the floral print everywhere on blogger world, that it is all beginning to look ordinary and the same, but you've made it truly your own and totally eye-catching. Tres chic! Although I LOVED your long gorgeous hair, I must say the shorter version looks equally great!! Gorgeous pattern, it really is. Are you getting used to the hair yet? daring outfit but I love it! 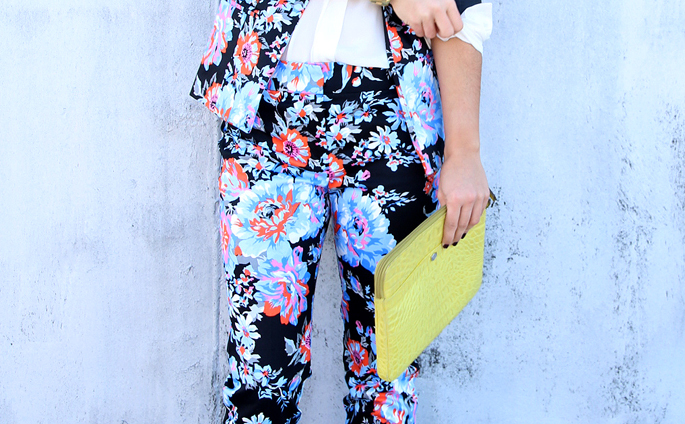 The floral print is amazing! So you got the pants and the blazer at two different places? So adorable on you and I love your flirty new hairstyle. LOVE the haircut! So bold! You look great, not many people can pull off something like this, but you did it very well! love this look! work it, pretty lady! amazeballs...you are totally rocking this! I love this look! You are rocking it! ahh! this is totally amazing! the print is stunning. loving your floral 'fit. =) your short hair is also lovely! congrats on "taking the plunge" and also for donating your locks! LOVE the hair! So adorable. Actually really diggin the floral on floral, too! Not sure I could pull it off but you're totally rockin it. Super cool look, not everybody can pull off that look but you've got the nonchalance and style to work it!!! There are very few people that could pull this off. You my dear, are one of them! Love! Gorgeous!! Love the flower print! Glad to see this spring's bold prints in person. You look fantastic. You're all about the suited look these days. Love it! You are so bold and it totally works for you! Love this suit! Love you blog, I got my hair cut as well couple mouths ago. I would like to know that which curl machine ? do you used? can you do how - to - do the hair you style. I am very looking forward. Yessss I love this, fell in love with this Asos suit as soon as I saw it! oh girl! I LOVE this! I would have never picked this up off the hanger - but I HEART this on you. and gosh, I am loving your hair! Whoa... check out that hair! It looks so great on you! Your hair looks fabulous! I chopped off over 6inches 3 years ago and I haven't looked back! I still sport my A-line blunt bob and I still never get tired of it. Short is the way to go! Beautiful printed, I love your new hairstyle, you look fab. I def will check out the hair salon you recommended. Hair tutorial please! The new do looks fab! love the prints and your new hair! love the prints! looks great! What a fun outfit! I could never pull this look off, but you look great. Ah I was just thinking of florals the other day! Great outfit! Such a hot, bold print! You are one of not many that can pull this off! you look fabulous! love this print and the suit. Oh my god- you are SO cute! it lookkss so nice and perfect!!!!! !that colours!!! how daring and fresh! I love this! Those cropped trousers just winged their way to me from ASOS as well. I love them, the colours are really punchy and perfect for spring/summer. Your hair looks amazing! Congrats for doing it...I know it's hard to part with with (I donated mine about 2 yrs ago), but it is for a great cause! So daring and only you could pull this off and look gorgeous doing it! Also I am loving your new do, such a bold move that looks great on you! Não acredito que vc cortou seu cabelo......eu copiei até as fotos para deixar o meu crescer lindo como o seu... ficou lindo o novo visual, mas o cabelo comprido....ah! uma isnpiração... o que dizer, curta sua nuca a mostra, que eu sofro pra deixar o meu crescer. bjs, lindo blog! adoro. how fun is this!! not too many people could pull something like this off but you seriously rocked it! I love love LOVE this print! Absolutely fierce. 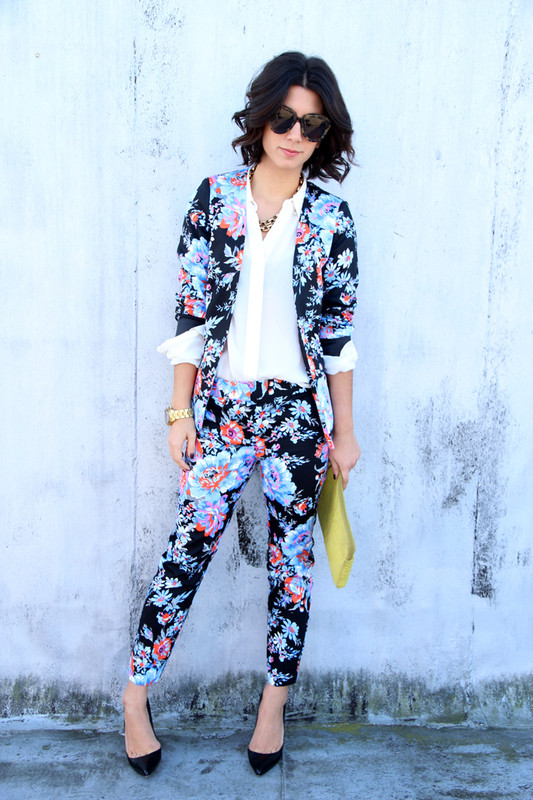 You look gorgeous in this floral suit! By the way LOVING the short hair, so chic! OMG! What an amazing outfit! Love every detail and the hairstyle as well! This will be hit on spring,I adore the outfit! 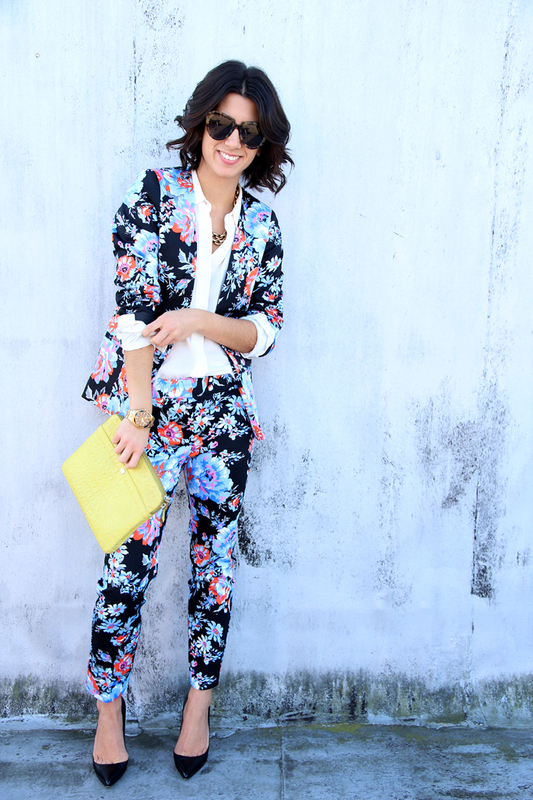 This suit is so amazing and you really pull it all together - you go lovely!